I met Vijaya Ramaswamy, professor of history at Jawaharlal Nehru University (JNU) a couple of months ago, through Joseph O'Connell. She asked me to present a paper at a conference on devotion and dissent in Indian history. So that is where I was last week, March 11-13. She was very hospitable and I especially enjoyed meeting her mother, Sethu, and so I thought I would just write a short blog about them. 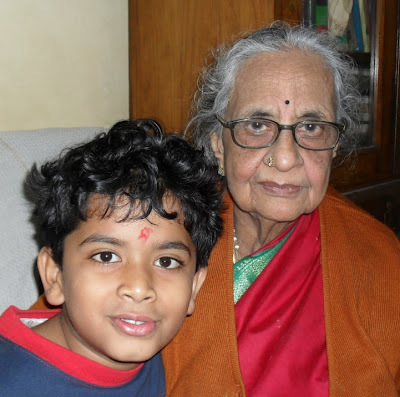 Vijaya's mother, Sethu Ramaswamy, seen here with her nine-year-old grandson, Vijay Krishna, is a pretty amazing woman. 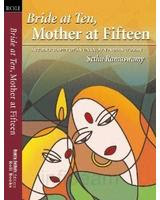 She wrote a memoir called Bride at Ten, Mother at Fifteen which I just finished reading this morning. What I like about Sethu Ramaswamy is her energy. At the age of 86, she has just published her third book in the last ten years, on the life of Raman Maharshi. In fact, she got her M.A. in history when she was 80. She was born into an elite Tamil brahmin family with royal connections in the Travancore kingdom, spent the first part of her life in Ceylon, then in Trivandrum and finally the major part of it after marriage in Delhi. Despite being a member of the privileged elite, education was not a part of a woman’s destiny in those times, and when she was married at the age of ten, her formal schooling was stopped. Her memoir, though I wish at times that it were a little more detailed, gives a fair account of the changing face of India in the 20th century, both the good and the bad, particularly where attitudes to women, etc., were concerned. One interesting anecdote, which she told me in person, was that at one point, she decided to open a bank account to deposit the money that came from selling all the newspapers that accumulated in their house. Her husband was a journalist and received six different papers each day. When he found out that his wife had opened a bank account, he was furious and made her close it immediately. The turning point comes when, upon reading Pearl Buck’s Pavilion of Women at the age of 40, she decided to strike out independently. She stood up on her birthday and announced to her husband and six daughters that she had decided to take control of her own life. And it was then that she began her education in earnest, even while she continued to carry out her responsibilities as a wife and mother. 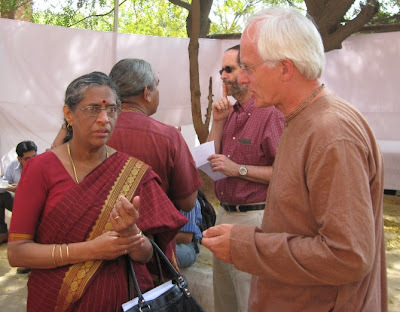 Vijaya Ramaswamy has also written several books of a very high standard of scholarship. As her mother writes, “Vijaya, my youngest, is the scholar of the family. Apart from being a university teacher, she has authored three books. Though by profession a historian, she has, because of her deep religious faith, done her research on spiritual movements, especially women saints. She is also into Women’s Studies. Her marriage to Krishnan, who like my husband is a freelance journalist and research consultant, has given me the greatest happiness in my life.” There is, a big story behind that, as they were married when she was 44, and they still were able to have this marvelous son. Vijaya’s book on south Indian women saints, Walking Naked, is an impressive piece of scholarship with a great deal of analysis about the expectations of women in society and the renunciation of these roles by these brave sadhvis. Her book is a delight to read. She is a good story teller, but the real value of her narration lies in the fact that she is sharing a remarkable personal insight into the subject, and not simply a scholarly one. It reminds me of Karen Armstrong's style in The Case for God, simultaneously a scholarly and devotional approach, which is somewhat controversial in academic circles, in that she does not simply accept the kind of feminist critique that sees religion itself as a patriarchal institution, without admitting of a true transcendence beyond gender. In almost every one of Vijaya's observations I found confirmation of my own view that women's saintliness has always been coupled with dissent, a protest against prevalent gender roles. Like Elizabeth Abbott in A History of Celibacy, she shows that the female experience of spirituality is different from that of men, and that this is directly related to their differing attitudes to and experiences of gender roles and sexuality. This is a picture of me talking to her. She was very busy organizing the conference and playing the host. I will try to give a short summary of the papers and presenters, if I get a chance. That is a big job and doubtful. I will publish my own paper on the other blog. 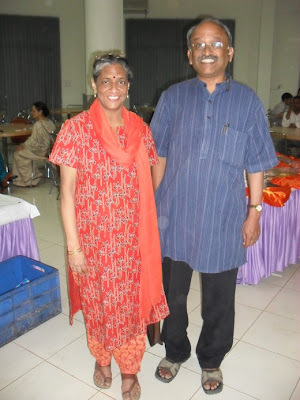 Vijaya Ramaswamy with her husband Krishnan. "She stood up on her birthday and announced to her husband and six daughters that she had decided to take control of her own life." I just discovered this site, a providential accident. Proud of you Dakshina - follow your heritage! I am ever grateful to God for the wonderful parents SHe chose for me. Yesterday, on March 4th 2012, my mother told me, "Life is about living - what that living is, only you can decide; how much, only you can decide; how well, only you can decide; and how not, is also something only you can decide. I shall try to follow this energy, my mother, Sethu Ramaswamy. Thank you Jagat for this story, about Vijaya,my sister and my mother, Sethu Ramaswamy. I just read this letter announcing the passing of your mother. She was definitely an extraordinary person, and having a daughter like Vijaya was one of the pramans of her true indomitable pioneering spirit. I remember when I was at their place at JNU and I sat in meditation in the puja room and she joined me there. I truly felt the strength and intensity of her devotional and spiritual concentration. I know that the whole family will miss her greatly. Indeed, it is a loss to the world. Let us be grateful that at least she left a memoir and contributed to the history of women in India in that way, as well as by her other writings.